The Ferrari 340 America was the first model of the Ferrari “America” cars which would reach their pinnacle in the 1960s with the Ferrari 400 Superamerica. They all wore bodies by either Ghia, Vignale or Touring. Built from 1950 through 1952, the 340 America would be replaced by the exceedingly rare 342 America. Only 22 examples of the 340 America were built – eight of which were sold as decked-out luxury tourers for the street. Of the remaining 14, only three were spec’d as Competizione models from Ferrari. This, car #17, is one of those cars (and it is also one of only four bodied as a Vignale Spider). The consignor acquired the car in 2011 after it had passed through countless other owners. The restoration dates to 2000, but it’s been lovingly cared for and lightly used on the historic circuit – namely the historic running of the Mille Miglia. This former factory racer will bring big money when it crosses the block in January. Click here for more info and here for more from Bonhams. 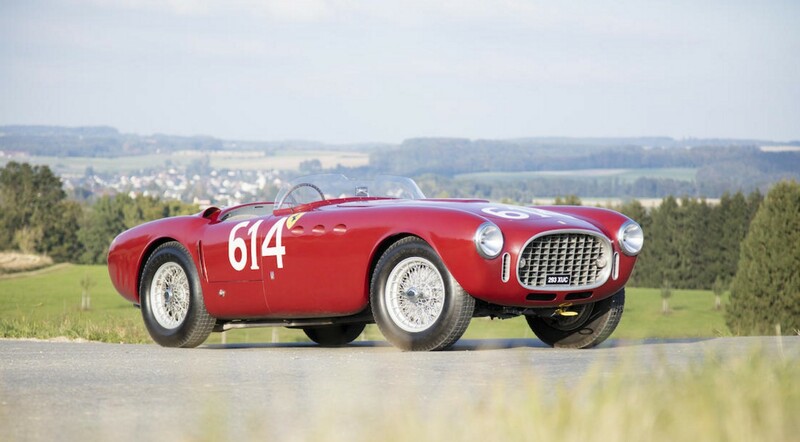 This entry was posted in Uncategorized and tagged 1952, 340 america, auctions, Bonhams, cars, classic cars, competizione, ferrari, race cars, spider, vignale by classiccarweekly. Bookmark the permalink.